Home » Useful Guide » How to deinterlace MTS/M2TS video, remove interlaces? How to remove interlaces from the recorded MTS/M2TS videos by using AVCHD camcorder like JVC GZ-HM400, JVC GZ-HD10, JVC GZ-HM1, Canon HF S10, Canon HF S21, Panasonic HDC-SD100, Panasonic HDC-TM700, Sony HDR-SR10, or Sony HXR-MC50E, etc? Is there a deinterlace filter could perfectly remove interlaces from MTS/M2TS videos? 1.Why could interlace effect happen? If you have a AVCHD camcorders like JVC, Canon, Panasonic, Sony etc, you could know that the camcorder divides each frame into a set of even and odd horizontal rows: first the even rows are recorded, and then the odd rows. So, each frame you see consists of two consecutive pictures. This mixing is called interlacing. Thanks to interlacing, your camera can compress video without using digital compression methods.But if you record a fast moving object, it can appear at one place in the "even" picture and at another in the "odd" one. As a result, you get a "striped" picture. The Deinterlace filter transforms the mixed frames into normal video frames and removes the interlaced horizontal rows. 2. How to perfectly deinterlace MTS/M2TS video, remove interlacing artifacts? Step 1: Please free download the program Aunsoft MTS/M2TS Converter for Mac, which is a powerful AVCHD video converter could also let you perfect remove interlaces from your AVCHD (MTS/M2TS/TS) videos. Free download now: Aunsoft MTS/M2TS Converter for Mac. Step 2: Please launch the Mac MTS/M2TS Converter; import your AVCHD (MTS/M2TS/TS) videos into this program. 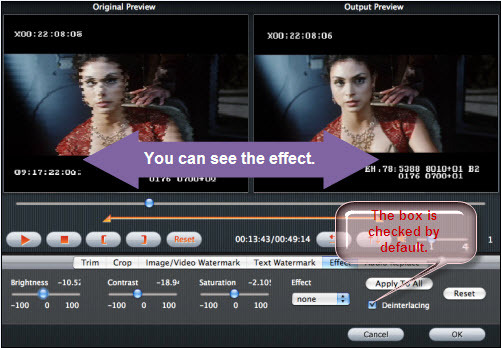 please click “Editor” into a new window, you will see a function of “Effect”, click it, and find the “Deinterlacing” box, you will notice that the box is checked. And you can see the interlaces in your MTS/M2TS videos have been removed perfectly in the right preview screen. Please check the follow picture. After done that, please select output format and click “Convert”, then the converted videos files could be very perfectly enjoyed on your Monitor or HDTV without interlacing artifacts. Yes, just a very easy step, you could deinterlace MTS/M2TS videos, remove interlaces from AVCHD files quickly. Welcome to visit Aunsoft Camcorder Column we provided for you.